It was a beautiful day to get out and paint. It wasn't as hot as the last day I painted at Short Sands but it was still quite warm. I used my easel umbrella as there was no wind until the end when it started gusting. I just closed the umbrella while I finished that last five or so minutes. This is an hour and a half study. The shadows change so dramatically in such a short time. This is not a great painting and I would certainly not consider this a finished painting. It is a good working study. I also learned quite a bit. I was working on not only catching the stunning shadows and rock shapes but starting to get a bit of texture and form. Here is a close up photo and then a photo of it on my easel. The last picture was taken as I was packing up. Note the difference in the shadow shapes between the painting and the actual scene in the background. Please ignore the drawing. It was heading south as I was struggling to nail the shadow shapes and keep them there in my painting. 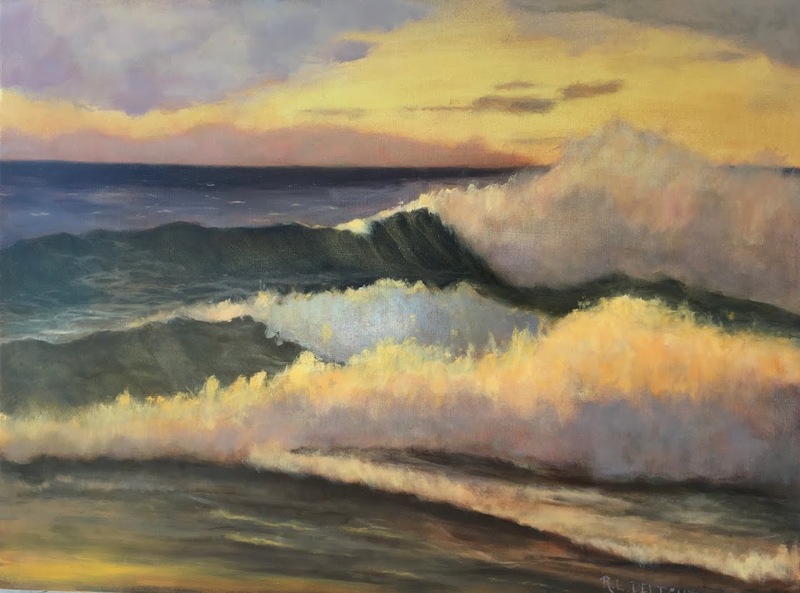 I was working so fast that when a trio of gentlemen came over and asked if they could peek, (I said of course and explained that I was just starting the painting out), I never saw what they looked like as I never took my eyes off the scene I was painting! I used larger canvas size than I usually paint on. 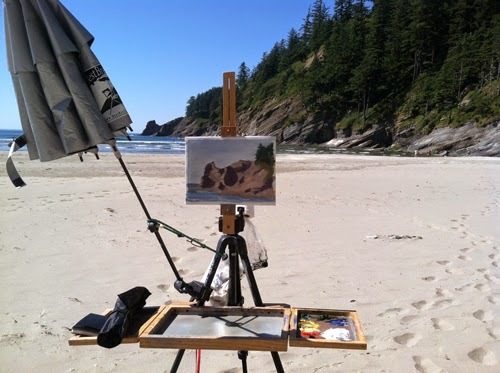 I want to try painting a little larger plein air studies too. I am actually liking the larger format. It will take a bit of adjustment though. 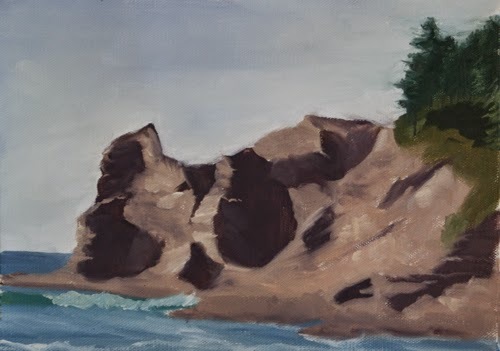 To finish up my post about my road trip to the Coos Bay Art Museum I will say I had mixed feelings about the exhibit. It really was educational to see other work up close but I was a bit disappointed. I have had the opportunity to see the work of a few artists that I admire tremendously. My goal is to get to the same level of skill and quality that they are. I will note here that I am not trying to copy their style. They have worked at art much longer than I have and worked hard. It shows. There was good work at the show, again by artists who have been working a long time. I was disappointed because it was pretty obvious that all most of the work was painted from photos. I have mentioned before that I believe that using photos as reference is a personal choice. I don't use them because I love painting from life and I believe I personally paint better when I am responding directly to my subject. To me the paintings made from photos looked, well, like photos, rather flat. They also looked too stiff. I don't know exactly what I was expecting but I did think there would be some plein air paintings and paintings made from life studies, etc. That said, I came away with a few important personal observations. I also enjoyed looking at the art. That all makes it completely worth the trip! One more unusual week to get through and then hopefully settling into a routine. I am working hard on getting a routine down and am determined to make good progress in my skills. Renee you have beautiful tones in the shadows of your little study! How do you know when a wok is done from photos? Some painters paint in a photo realistic style. Is there a lack of information in the lights and darks? Hi Theresa! Sorry I have taken a while to answer your question about how do I know when a work is done from photos. Before I answer that I want to restate that working from photos or using photo references is the personal choice of every artist and I completely respect that. I have made a personal choice not to use photos or photo references (at this time) and know of a few artists who also work that way. I say all this because I don't want people to think that I am criticizing those artists who do use photos. That isn't my intent. I just happen to resonate more with work that is mainly painted from life experience or imagination. That said, I cannot be 100% sure without asking the artist! I am about 99% sure by looking at most paintings that have been painted using a photo. Looking at a photo one can see that the values are rather flattened, meaning there isn't a wide range of vaules and the details are generally very sharp. The paintings I saw all had these qualities. They looked like a painted version of a photograph. There are experienced artists I know, or know of, who do use photo references in their work quite skillfully. They usually have a lot of experience working from life, use the photos more to refresh their memory of details rather than to copy details, and understand how and why photos flatten the view and compress the range of values and color.